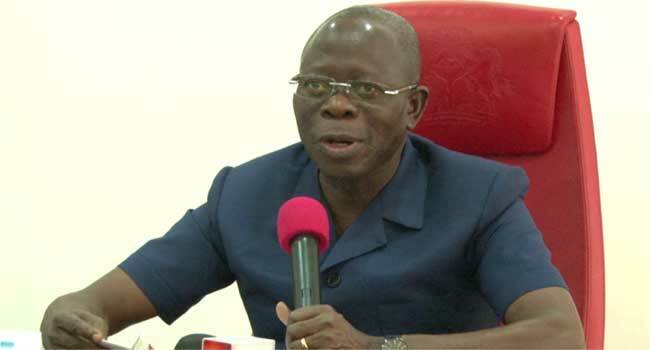 Governor Adams Oshiomhole of Edo State has commissioned two industrial boreholes and a water treatment plant in Ihievbe, saying his administration has sunk hundreds of industrial boreholes across the state in line with the policy of the Millennium Development Goals that every human being, whether rich or poor, is entitled to clean water. Speaking while commissioning the boreholes at Ihievbe, Owan East Local Government Area of the state, Tuesday, Governor Oshiomhole said, “let me congratulate our people from Ihievbe; this is one of the two industrial boreholes that we have installed and the small mini-water treatment plant. The whole idea is to ensure that if this borehole produces water, it doesn’t need to go through additional processes. He said, “My hope, wish and prayer is that with the availability of this clean water for the people of this part of Ihievbe, all those water-borne diseases and child labour which children are subjected to going to the stream to fetch water, even sometimes competing for flood water with animals that the presence of this industrial borehole will make all that a thing of the past. The Governor continued, “The only thing I want to emphasise is that as you can see, we have not only sunk an industrial borehole, we have put a giant reservoir. We have built a generator house. We have put a water treatment plant. So, this is complete mini-water works, but let me be honest with you. We have provided this, it is now owned by the people of this community. Like your personal property, please maintain it. Remember that the generator is mechanical and it requires servicing and remember that the generator cannot work without diesel. The highpoint was the symbolic cutting of tape by Governor Oshiomhole to commission the borehole project.